Turn right (southeast) on Jenks Lake Road West off of Highway 38. One-quarter mile from Highway 38 is a signed dirt road on your right. This is a rough, rocky road not intended for low-slung autos, but is usually passable. Look for the trailhead signs at the parking area – Adventure Pass is not required at this location. Only one obvious foot trail leads up from the trailhead signs and you will come to the Wilderness boundary sign just before a half mile of uphill hiking. About a tenth of a mile beyond the Wilderness sign you will come to a trail junction sign marking the cutoff for John’s Meadow (heading to the west). The trail to Johns Meadow continues West from the junction. As you continue across the side of the mountain, you will have several minor gains and losses of altitude. A lot of the steep climbing to Johns Meadow occurs in your first mile from the trailhead. 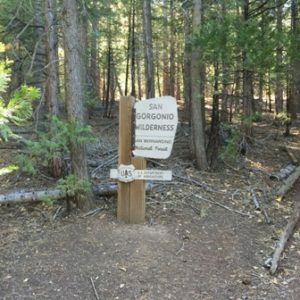 As you get close to the end, you will come to Forsee Creek and the trail will lose about 100 feet of elevation as you hike down to the creek crossing. The creek usually flows year around and the crossing can be tricky but normally not too difficult. John’s Meadow (and camp) is located about 100 yards beyond Forsee Creek and is at 7,200′ about 3.9 miles from the trailhead. Plenty of water is available here year-round. 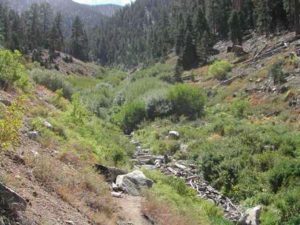 Beyond the Johns Meadow Camp, there is a trail that crosses a smaller creek (which usually flows year around also) and the trail continues up to the trail junction at Manazanita Flats and can be used as an alternate route to San Bernardino Peak. Four miles from the trailhead (6,400′) is Jackstraw Camp. Jackstraw Camp (9,200′) is located .2 miles to the right (west) of the trail and is supplied by a small and intermittent water source. One and nine-tenths miles beyond Jackstraw is Trail Fork Springs Camp (10,400′). Water is located about 100 yards southwest of the camp at the Spring. To the east along the Peak Divide Trail lie two additional camps. The first, Anderson Flat (no water-10,500′), is .4 miles up the trail. The second is Shields Flat (no water-10,400′) 1.8 miles east of Anderson Flat, 2.3 miles east of Trail Fork, and only 1.2 miles west of High Meadow Spring (10,300′) which is the preferred water source. This trail is mostly shaded up to Jackstraw Springs Camp, and offers outstanding sunset views west from Trail Fork Springs Camp.